On 9/30, in the last 3 minutes of the market close, for some mysterious reasons Google stock price tanked while the rest of the market was going up especially after the 9%+ slide of NASDAQ yesterday, thanks to the bailout fallout. Being busy at work (no seriously), I missed out the opportunity to grab the stock at those lower prices. Ofcourse, it turned out that this is a big mistake and so NASDAQ is going to cancel many of those orders, so it wouldn’t really matter if I wasn’t busy at work :). Anyway, the problem I want to mention is, companies like Yahoo! still are showing $322.99, almost 11 hours later inspite NASDAQ’s correction. So, I used one of the stock quotes web services that I am aware of and tried out online the stock quote for Google (thanks to Visual Web Service which provides online forms interface to submit web services with http binding). Here is what I got as the response. So, essentially, if one popular web service goes wrong, all the business processes that make use of the web service would go wrong. The point is not to advocate that SOA is not good or anything, but just to point out that changing to SOA from traditional architectures will not solve certain types of problems. 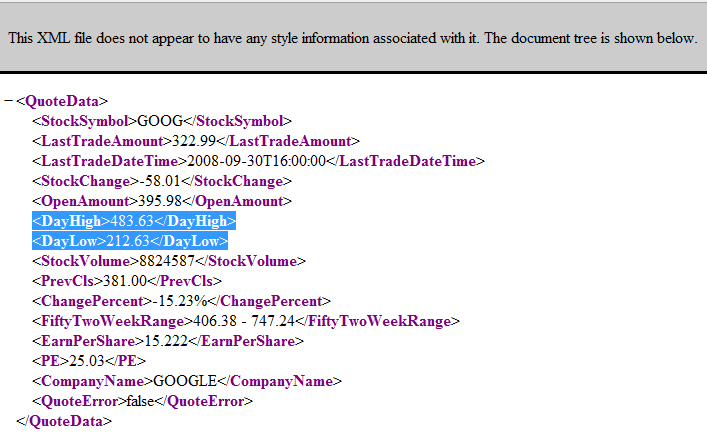 Now, it beats me how NASDAQ’s system would let it go through even if the error originated at a different market center.